Photo Release -- Northrop Grumman Dedicates Manned Aircraft Design Center of Excellence in Melbourne, Fla.
MELBOURNE, Fla. â Sept. 20, 2013 â Dignitaries including Florida Gov. 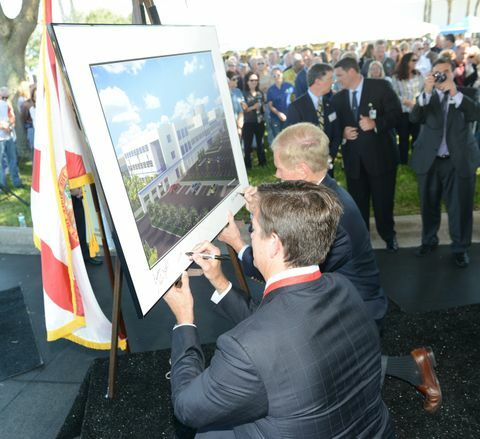 Rick Scott and U.S. Sen. Bill Nelson today participated in the dedication of Northrop Grumman Corporation's (NYSE:NOC) Manned Aircraft Design Center of Excellence in Melbourne. Scott kicked off the event, which also featured remarks by Nelson and company officials. Representatives from other federal, state, regional and local offices, and civic organizations also attended. Northrop Grumman announced the creation of several centers of excellence around the country in March, for the purpose of improving its strategic alignment with its customers' need for increasingly innovative and affordable products, services and solutions. The company employs more than 1,200 people in Melbourne, and estimates growing by an additional 1,000 employees over the next four years as a result of the designation of the site as a center of excellence. "Innovation, collaboration and performance are hallmarks of Northrop Grumman's commitment to meeting and exceeding our customers' needs," said Tom Vice, corporate vice president and president of Northrop Grumman Aerospace Systems. "Today marks the next step in aligning our talented workforce at this center of excellence to benefit our customers, our company and this community." The company recently broke ground on a new 200,000-square-foot building at its current campus adjacent to the Melbourne International Airport. The new building will accommodate program management and engineering teams, as well as integration laboratories. The new building is scheduled to be complete in the summer of 2014.